The Cistercians belong to a grand Benedictine family established by St. Benedict in the 6th century. He gave origin to the abbey – monastery built in Monte Cassino, Italy. In the 11th century, the followers of St. Benedict experienced the spirit of monastic life renewal. This renewal was started by one of Benedictine monasteries in France. Under the lead of St. Robert – the abbot, a new monastery was established in 1098 in the village of Cîteaux, in Latin referred to as „Cistercium”. This village gave the name to the order Cistercians. The development of the new monastic community was contributed to by St. Bernard of Clairvaux. In the history of the Church, St. Bernard is known as a worshipper of the Saviour and Our Lady. During his life, many Cistercian monasteries were founded across Europe. The Cistercians arrived in Poland from France – the cradle of the order, in the 12th century. In Poland, the monks built over 25 abbeys. In 1222, Cracow bishop Iwo Odrowąż brought the Cistercians to Mogiła near Krakow. The monks constructed the church and the monastery that has operated continuously until present. At the church, there is the Miraculous Cross of Lord Jesus – the destination of pilgrimaged by Polish kings, as well as believers from near and far. It was before the Miraculous Cross that Holy Father John Paul II prayed during his first Pilgrimage to Poland in 1979. To the pilgrims gathered, he talked about the worship of the Cross and the dignity of human labour. In 1949, close to the old Cistercian monastery, the construction of Nowa Huta district and the metallurgy plant began. Residents of the worker district of Krakow started filling the monastery church. Krakow bishop Adam Sapieha entrusted the pastoral care over the new population to the Cistercians. After several years, the parish of Mogiła included over 30 thousand residents. By the decision of Rev. Cardinal Karol Wojtyła, in 1977, the Cistercians started forming a new parish and building a new church. 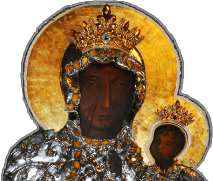 The parish dedicated to Our Lady of Częstochowa and Blessed Wincenty Kadłubek – Bishop in Krakow, and the new Cistercian monastery, were established as a result of division of the monastic community from the nearby abbey in Mogiła. The area of the new parish covers the districts located around the Central Square. The construction of the church and the monastery lasted 11 years (1984-1995). The church architecture partly refers to sacral buildings in the spirit of Cistercian churches, characterised with simplicity and moderation. The church is made of two parts: bottom part, of clinker brick, and steel structure of 36 m. The whole is crowned by the Cross (10 m). The roof of the church is broken to resemble the structure of a spatial crystal. Both parts of the church: the traditional bottom part and the top concourse part, form the uniform whole. The interior of the church is decorated with simple numerous brick arches repeated along the walls of the entire church that are made without windows. Daylight is provided from the top through glazed high roof. The main wall of the church features three niches. The central one houses the image of Our Lady of Częstochowa – the Patron of the parish. The image has been decorated with ears of wheat and grapes. In the left niche, there is a copy of the Miraculous Image of Lord Jesus of Mogiła, while in the right – the figure of Resurrected Christ. At the balconies, there is the Way of the Cross sculpted in wood, and decorated with polychromies. The altar, the baptismal bowl, and the pulpit have been made of white marble. On the left side of the church, there is the Altar of Merciful Jesus with the image of St. Faustyna and of St. John Paul II with his relics. Blessed Wincenty Kadłubek – Krakow bishop and Cistercian – has a separate Chapel. This is a place for daily adoration of the Holy Sacrament. The chapel is separated from the church with Our Lady stained-glass window devoted to the family. At the bottom part of the church, there are pastoral rooms for groups active in the parish. At the front wall of the church (on the entrance side), there is the bell tower. It has the form of a stylised chalice. The structure of reinforced concrete houses three bells: Holy Mary, Bernard, Wincenty. Church corners are decorated with the figures of four evangelists: Luke, Mark, Matthew, and John. At the church square, there is a prominent statue of the Patron of Solidarity movement, Blessed Rev. Jerzy Popiełuszko with the Cross in his hand (2006). The Church of Our Lady of Częstochowa is one of nine churches built in Nowa Huta District (2014). It can house about two thousand people. It was consecrated by Rev. Cardinal Franciszek Macharski on 11 June 1995. At the church and the monastery, there are many pastoral and cultural initiatives.